You may have seen my Easy Vegan Falafel, Vegan Tzatziki or my Vegan Pita Bread go up on my sister site, Living Vegan. 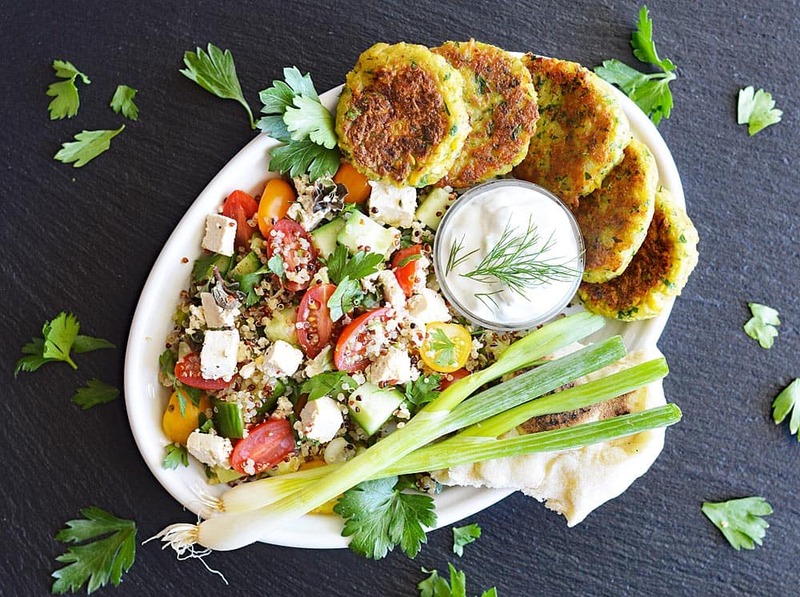 But what made our meal complete, was my take on this Vegan Quinoa Tabbouleh with Tofu Feta. 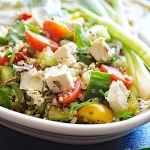 Multi-colored cherry tomatoes, tri-colored quinoa, cucumber, salt, pepper, lemon juices, olive oil, a few scallions and herbs like mint and flat leaf Italian parsley make up this salad. 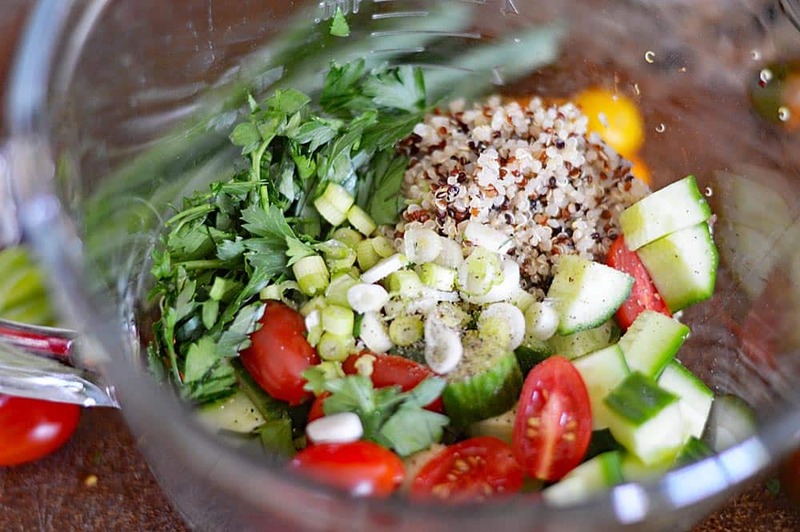 Lots of fresh ingredients which help make this Tabbouleh taste absolutely fantastic! The best part of this recipe is that aside from the Feta marinating (which I did overnight), everything gets gently tossed in a mixing bowl, and just like that. You’re done! I’m in love with this tri-color quinoa. 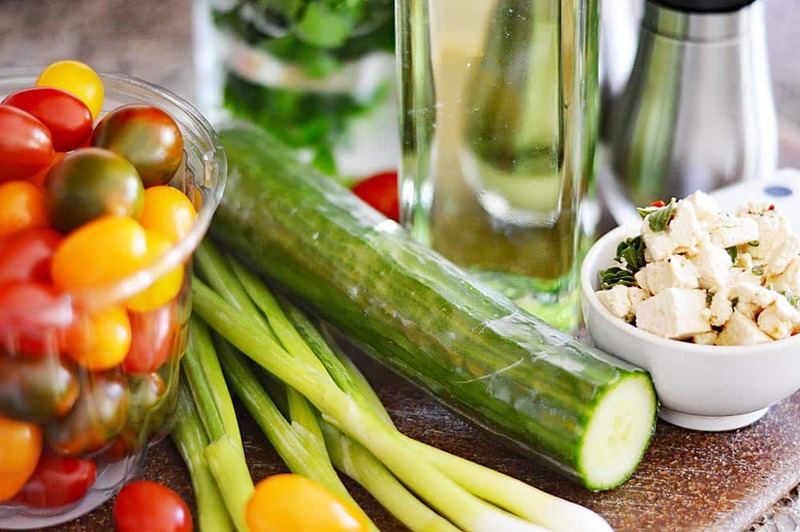 Organic, priced really well and at…Walmart of all places! It’s their Great Value brand. Here was the final plating. Easy Vegan Falafel, Vegan Tzatziki, Vegan Pita Bread and Vegan Tofu Feta. The components in an of themselves are all incredibly simple. Falafel reheat REALLY well. I put them in the toaster oven and served with the leftover Tzatziki and salad. Quite frankly, everything in this meal could potentially have been prepped in advance. The Pita take about 1-1/2 minutes per side, so they were exceptionally good served warm right from the pan. I cut the leftovers up and made pita chips the next day! 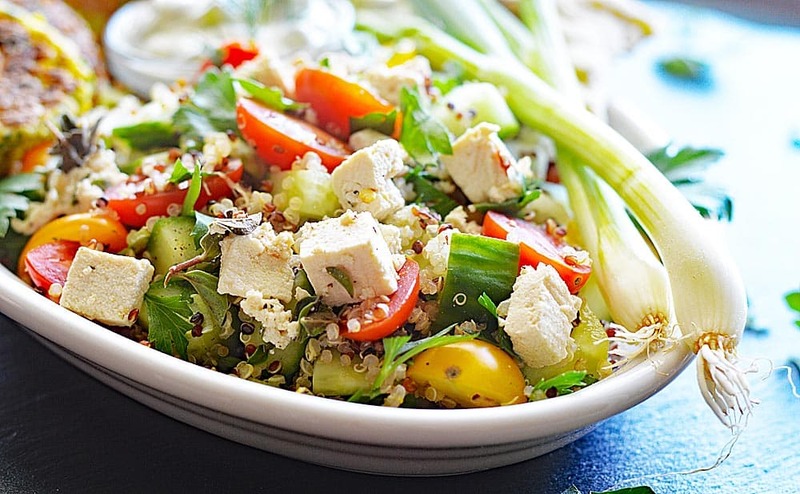 Did you make this recipe for Vegan Quinoa Tabbouleh with Tofu Feta? Let me know in the comments section below. Prepare quinoa to package instructions and fluff with a fork. In a bowl, combine all ingredients, folding in the tofu feta last so as not to break it up too much. Taste for seasoning, adding salt and pepper if necessary. Serve at room temperature or refrigerate and serve cold.